Whether you use it to work from home or to plan your side hustle, getting the right computer desk is the most important part of designing a home office, so we've rounded up our favourite to help you find the perfect fit. Serious studies and traditional spaces need a grand desk at their centre, and on the high street they don’t come much grander on this. Granted, this Romina desk has a price tag to match its refined looks, but on top of a high-end solid wood construction, it boasts gorgeous design details you’d be hard-pressed to find anywhere else. We’re most taken with the slimline drawer hidden just under the desktop, an elegant storage solution that’s just right for housing those gorgeous notecards and your favourite pens. It can sometimes feel a little odd having a pristine, high-tech new desktop computer perched on a period-style desk, so if you prefer a more modern vibe you may want to look to John Lewis for interior inspiration. 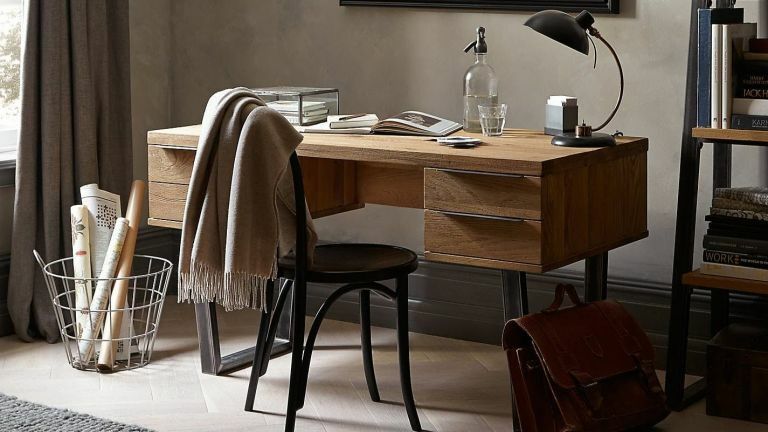 This desk from their Calia range is beautifully and sturdily made from solid oak with distinctive industrial-style legs, a cool new take on the popular mid-century-style hairpin leg, and it packs four spacious drawers for storing extraneous electricals, CDs, and other computer-related accoutrements. If you like the industrial elements of John Lewis' Calia desk, but your space or tastes demand something a little sleeker, the Baird Writing Desk might be more suitable. With longer, leaner legs and a shallower surface, it takes up less visual space than the Calia, but captures the same pared-back charm. While it may not be solid oak, it is still a decent equivalent for those on a budget. The big difference is the use of shelves rather than drawers, ideal for stowing chunkier office accessories. It can be unreasonably difficult sometimes to find furniture that perfectly meets your needs but doesn’t look overly clinical, but this Soreno corner desk from Walker Edison seems to fit the bill admirably. The beveled safety glass, which could run the risk of looking corporate in a bulkier desk, manages to look modern and luxe in opaque reflective black, while the slim spindles and angled legs that keep the desk sturdy give it a slight industrial edge. The pull-out keyboard drawer also helps immeasurably to keep things looking neat by keeping unsightly wires off the desktop, while the dedicated processor stand keeps your tower off the floor. Every element has been carefully considered, making this a very practical and pleasant desk solution. The ideal meeting between form and function, this Bell’O computer desk has a touch of the Art Deco about it thanks to gorgeous and unusual curved wood accents and elegant black spindles. The functionality, though, is purely contemporary. The central reinforcing bar boasts the simple solution of a hole for your cables, keeping everything corralled nicely so as not to detract from the look of the desk, and the tinted and tempered safety glass pull-out looks fantastic, while giving you space for your keyboard.